Major Carey S. Hughes gave nearly his entire life to his country, serving as a fighter pilot in not only World War II, but also in the Korean War and Vietnam. He passed away in 1981, at the young age of 57, but his wife Martha recently shared her memories of his brilliant military career. Hughes wanted to join the military at a young age, right out of high school. 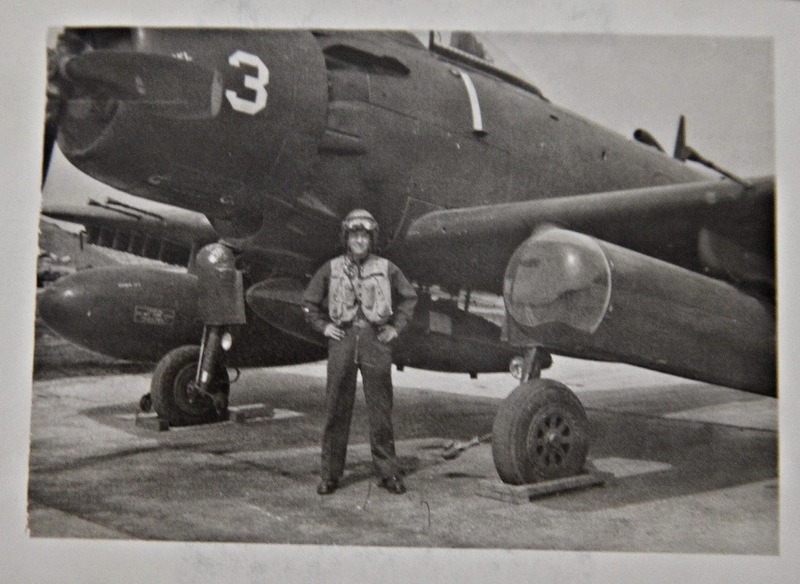 “He wanted to go into the service, as all young men did at that time, when Japan attacked us. Everybody was patriotic then, like they are not so much anymore, but he was too young and his parents wanted him to stay in college,” Martha said. 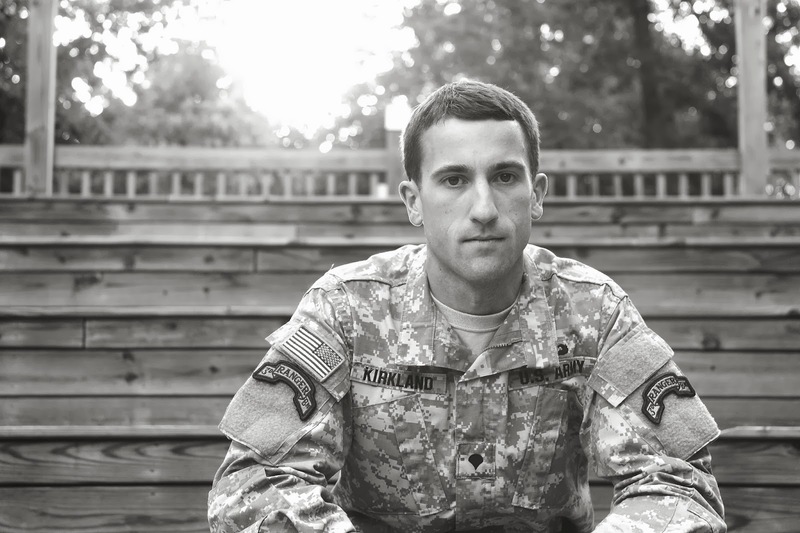 Instead of enlisting right away, Hughes honored his parent's wishes and spent two years at Vanderbilt University. After two years of college he was eligible to become a naval air cadet, so he enlisted in the Navy on December 10, 1942 and became just that. Before Hughes could complete his flight training, tragedy struck his family. His mother became ill and was diagnosed with cancer shortly after he left. Meanwhile, his younger brother John, who was fighting with the Army in the Pacific Islands, was in the process of coming home. Before he could make it back to his sick mother, however, he was shot and killed by a sniper. Before the family got word that John had been killed, their mother passed away. Shortly after, Carey got word that his father was in the hospital at Vanderbilt, but before he could get there his father too passed away. Hughes's family owned Merry Acres, a dairy farm in Huntsville. 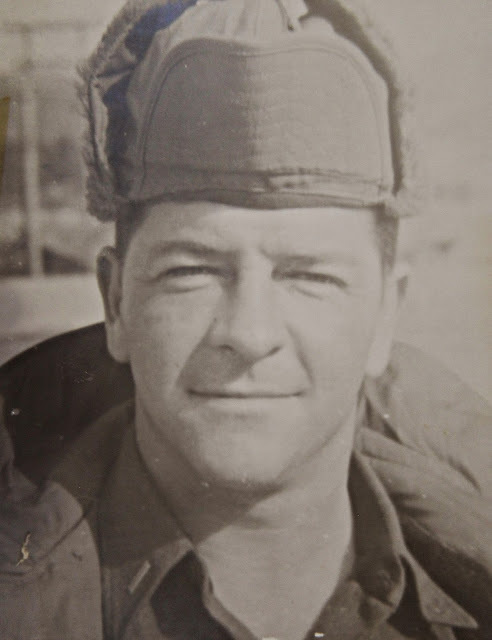 Because all of his immediate family was now deceased and Hughes had the responsibility of returning home to settle the affairs of the farm he could not extend his time in the Navy past the end of World War II in 1945, though he wanted to and he did remain in the Reserve. He was in Korea for about 16 months. During that time, Martha says he wrote her nearly every day. “Sometimes I'd get a whole bunch at one time after I hadn't gotten any for a few days. He wrote almost every day, so I got them frequently,” she said. Like many veterans, Martha says Carey never talked about any war in very much detail, but he would talk about the countries he saw. 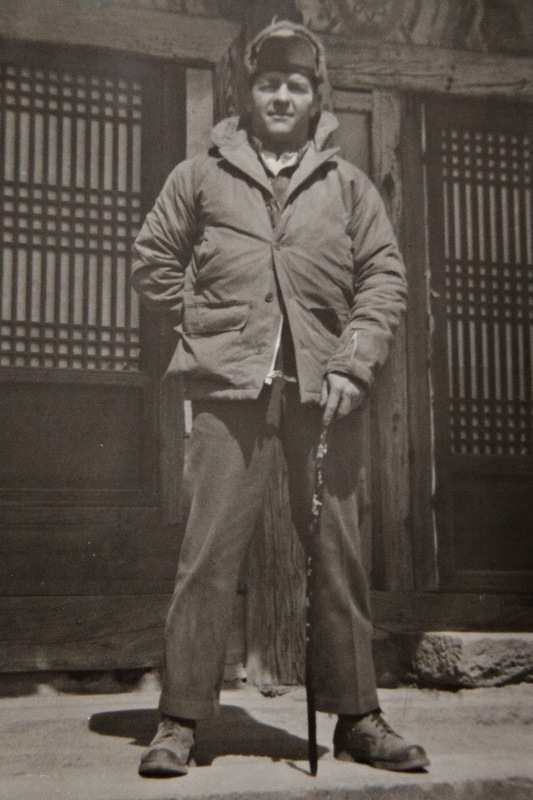 “In Korea he bought a motorcycle, more like a scooter, so he could travel around the countryside. 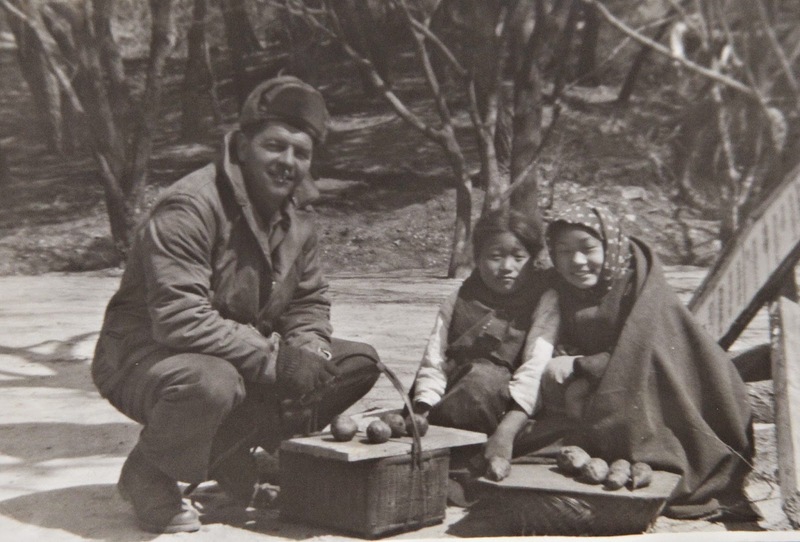 He liked to take his motor scooter and go around the countryside and he brought a lot of pictures back that depicted the Korean countryside showing the women washing their clothes on rocks in the streams... and the rice patties. He liked things like that. 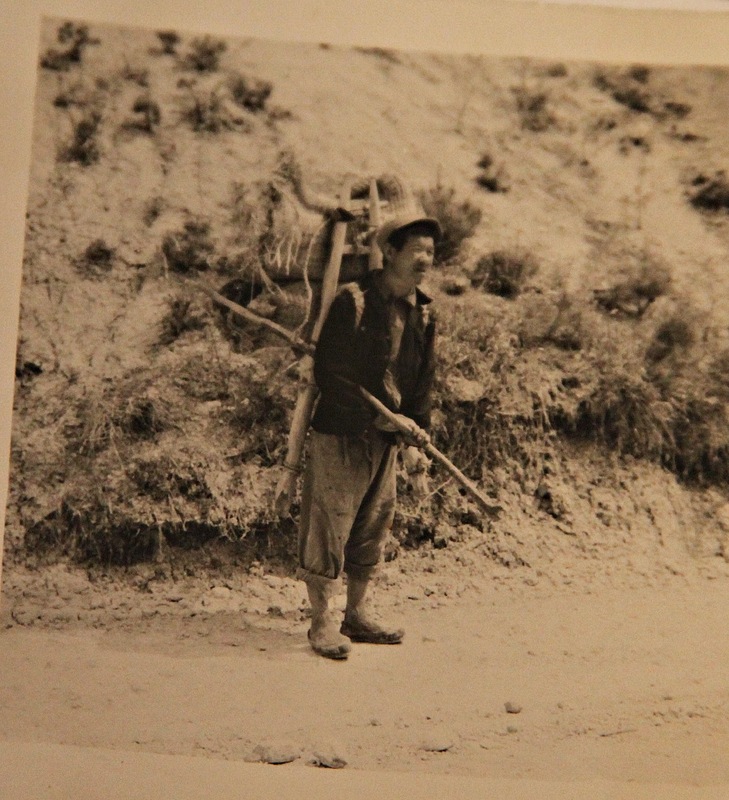 He liked to get acquainted with the culture and the people. He talked more about things like that than he did the actual war. I never questioned him a lot. Whatever he wanted to tell me was fine,” she said. From Korea, Hughes was sent to Japan , and Martha had the opportunity to visit him there, but the trip started with some confusion. “He got a telegram that should have said I'll be there at 10 o'clock on the second, but it read two o'clock on the tenth. So, he didn't meet me at the airport because he was still on his way. He didn't know I was getting there so soon. There I was, not speaking Japanese and not many Japanese people there spoke English. The red caps at the airport grabbed my luggage to take off and I had no where to go, so I was trying to get them to let it go...just pulling at them because I couldn't speak Japanese. Finally there was a Naval officer there who was a liaison officer and he tracked Carey down for me. He was on his way, so I stayed at a hotel there that housed civilians who were working for the government until he could get there,” she said. Hughes stayed in Japan for about six months after Martha's visit. “The 1st Marine Aircraft Wing was there and they were ordered to be back home when the war was over. It was a big deal. They had to account for every little thing and bring it back to the States,” Martha said. 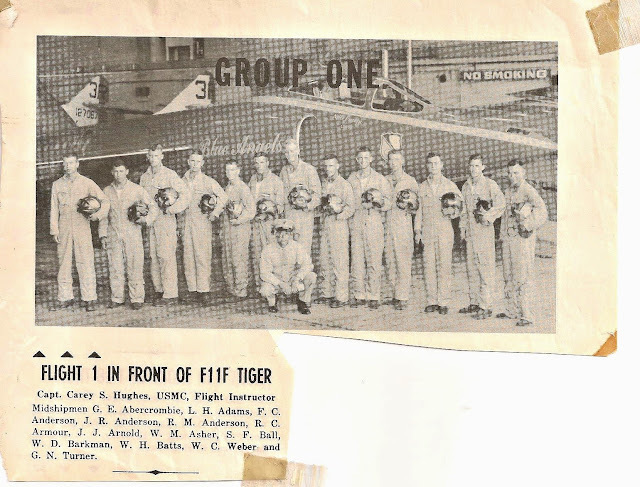 When Hughes returned from Korea, he and Martha were moved to Pensacola Naval Air Station in Florida where he served as a flight instructor. Hughes was stationed at Paris Island when he got orders to Vietnam. Martha said that the Vietnam War was probably the most dangerous for her husband. 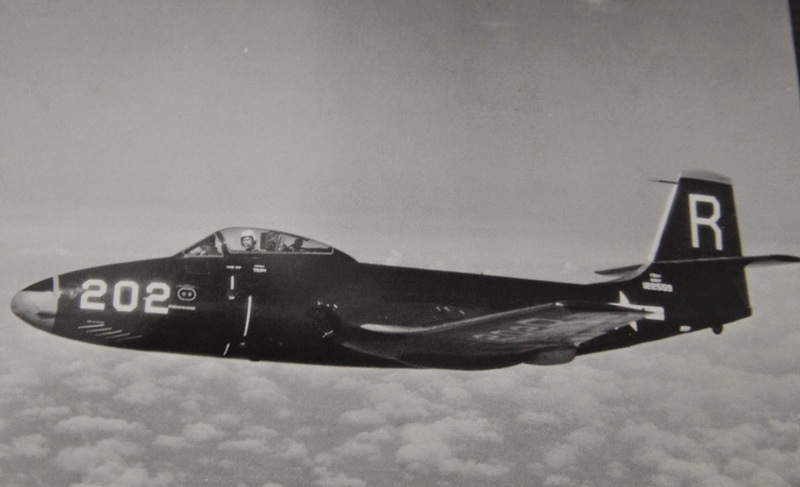 “In earlier wars, being an aviator, it wasn't like the troops fighting on the ground. They just flew their plane out and had fights in the air and then came back to a more or less safe place. But in Vietnam it was a closer war. There was more contact,” she said. Martha recalled the time that her husband was sent to Hawaii for R&R, rest and recuperation, during his Vietnam tour. “I met him there and he just wanted to sleep all the time. 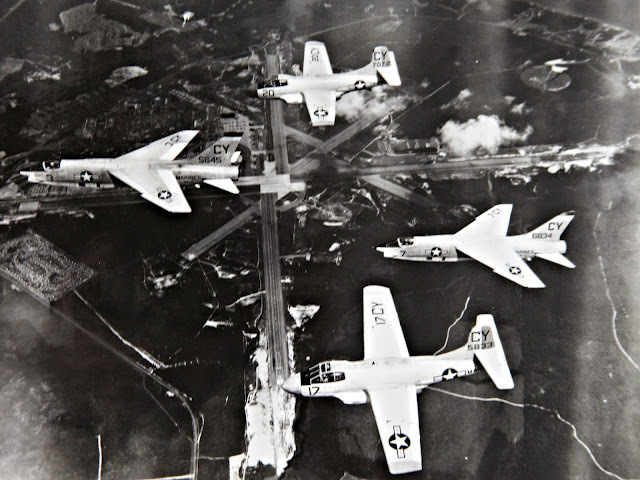 He said he never had a night's sleep because he had to wake up and go to the bunker room if they sounded the sirens that the enemy planes were coming,” she said. Though this was a tougher war for Hughes, he still wrote letters back home and called on occasion. And, like in Korea, he liked to explore the Vietnamese countryside, though what he saw wasn't always pleasant. “He noted that the children in Vietnam would try to take your watch off of your arm. They'd do primitive things, like put feces on nails so that they [American soldiers] would step on it and get infections. These weren't military things, that was just what Vietnamese civilians did,” Martha said. 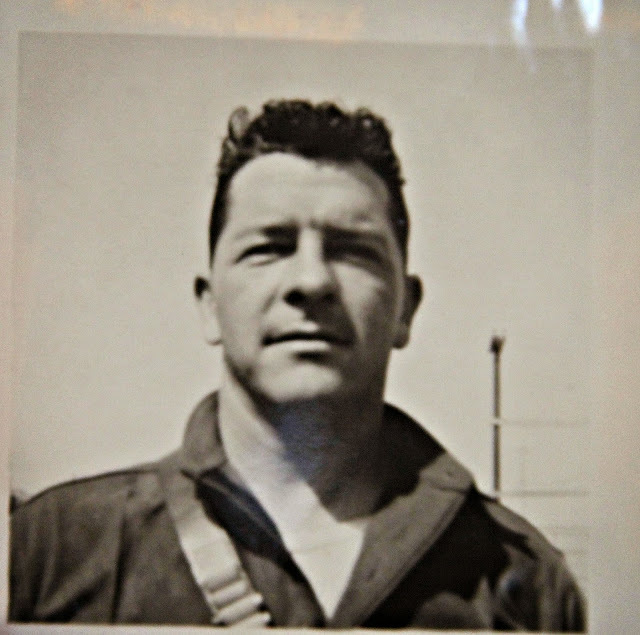 Hughes was awarded the Bronze Medal for Valor during his military career. 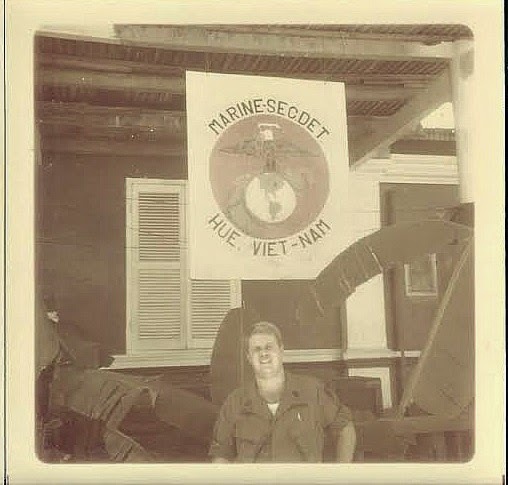 He retired from the Marine Corps on June 30, 1971, at the age of 47. By this time, he and Martha had built a home on Roseberry Creek in Scottsboro, where they lived with their two sons, Carey, Jr. “Butchie” and John. 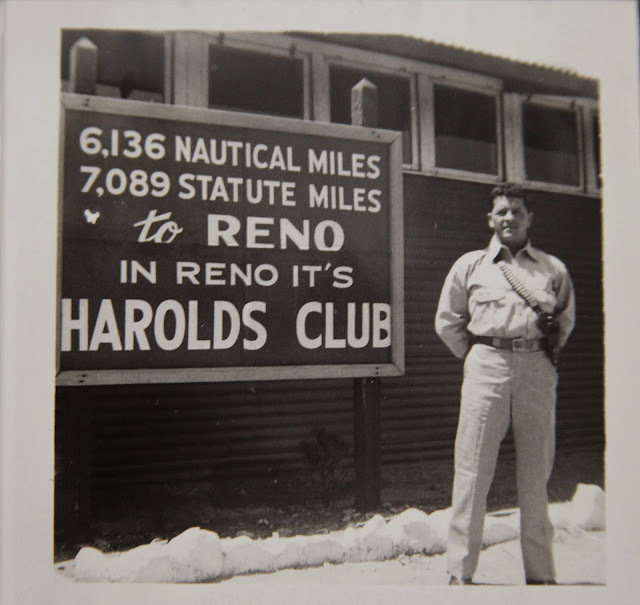 After his military retirement Hughes worked as the personnel manager at Halstead, served as the President of the Rotary Club and ever the aviator, he owned and flew his own Cessna airplane. Don Hodges was in the middle of his college career, working to become a pharmacist, at Samford University in Birmingham when he enlisted in the United States Army. Until that point he had been deferred from the draft, but because he could not afford to attend school full time his deferment ran out. “I was afraid that if I was drafted, because of my pharmacy background, that they might make me a medic. That, of course, was a very high risk job in Vietnam, so I went ahead an enlisted so I could pick my choice of school,” he said. Don was 23 years old when he enlisted, several years older than most people he served with. “I really wish I had gone sooner and gotten it over with,” he said. 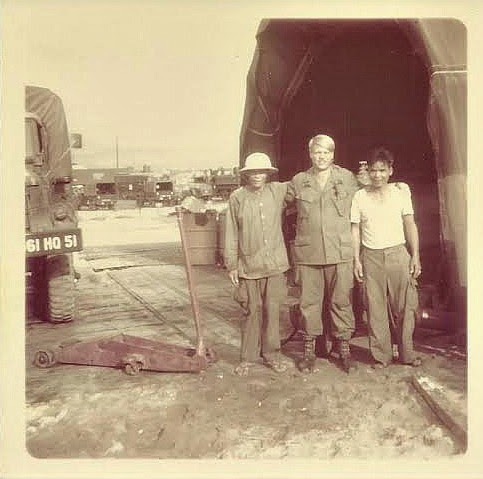 By the age of 25 he was in I Corps, where he would spend eight months, next to North Vietnam. Though he was scared, he said he was lucky in many ways. “I was always back at at established base at night. I never had to spend a night out at what we referred to as the boonies. I ended up seeing more action than I wanted to, but the main thing is I didn't have to stay out at night,” he said. 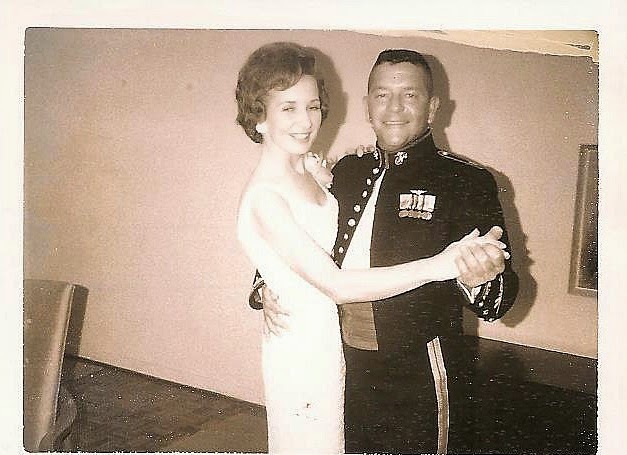 Hodges had gotten married before he was sent to Vietnam. “We missed each other a lot. There certainly were a whole lot of letters,” he said. “We also had tape recorders that had a reel on them and we would make tapes and send them back and forth. When she would visit my mother, my wife could let her listen to my tapes and she'd make me one. The mail was everything. It'd probably take five days, maybe seven, for mail to travel between home and Vietnam, but when you got it, it was current,” he said. Hodges says he doesn't like to talk in too much depth about his war stories. “It was pretty rough. And, I don't like to talk about it much either because it was such an unpopular war,” he said. 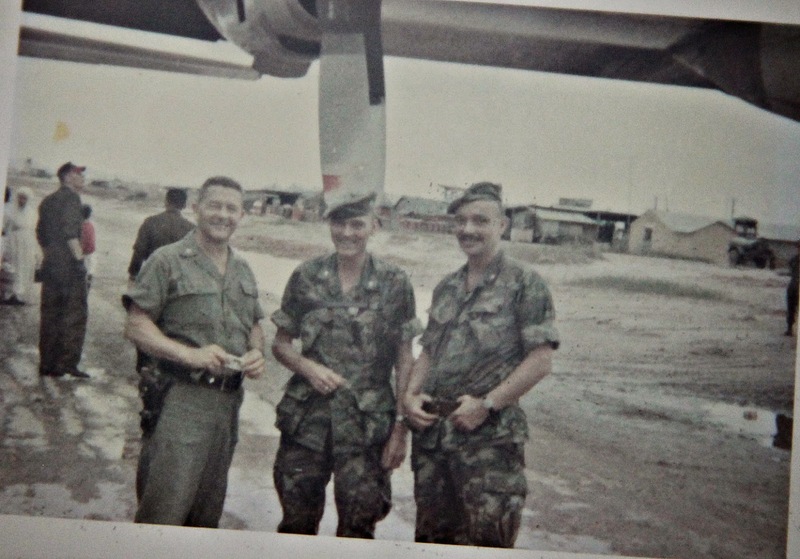 “When I was in I Corps I had to run down to Da Nang and do a courier run. There was a CBS news crew there that interviewed me, and I don't know if it ever got on TV or not,but the main thing they asked me is 'What do you think about all the protests going on in America now, especially by people your own age?' My reply was 'Well I wish they were over here and I was home.' I didn't want to get into politics or anything like that, but that's just what I told them.” he said. Hodges was born in Scottsboro to L.C. “Mess” and Elizabeth Hodges and though he only spent his first 18 years in Scottsboro, it is still the place he calls home. He is a member of VFW Post 6073 and even comes back most years to help at the county fair. When Hodges returned from Vietnam in 1970 he got to go back to school in Birmingham, where he has lived ever since. He is now a retired pharmacist. When I asked my husband why he wanted to be in the Army he told me that he had wanted to since he was just a kid. Part of his reasoning for this was because he wanted to be like the good guys he saw on television. "I always thought those dudes were cool, running around shooting guns. That's why kids want to be in the Army, because that's what they see on TV. They see dudes beating bad people," he said. "It's just something I wanted to do. It's just something you want to do or you don't and it was something I wanted to do." He thinks he was destined to be where he is today. He said he thought that true because when he was a little kid he and his cousin Patrick built forts together all the time. "When I was really little I'd just built them out of sheets and furniture in the living room. Then, when we moved out in the country I'd go out in the woods and build forts and brush piles and bridges and walls and paths. That's a lot of fun," he said. He almost joined right out of high school but says that his dad wanted him to get a college education first, and so he did. But as he was finishing school he realized he still wanted to be in the military, so he started looking at the process of enlisting. In March of 2011 he left for boot camp at Fort Benning. "It wasn't hard. You wake up early and stand in formation and go to PT and whatever training we had for the day we'd go do. It wasn't physically hard. I expected it to be like the movies where you get yelled at and beat up by the drill instructors, but that's not how the military is now." During basic training a recruiter came and talked to him and the others about being a Ranger. "I didn't know anything about it, but it looked cool. I already knew I wasn't going to like the job I was supposed to do (satellite communications). It seemed like a better place so I volunteered for it and went to AIT at Fort Gordon. I was there for 11 months and I went to airborne school in April of 2012 and I started the Ranger Assessment and Selection Program in August of 2012 and finished in October." The 75th Ranger Regiment is a lethal, agile and flexible force, capable of conducting many complex, joint special operations missions. Today's Ranger Regiment is the Army's premier direct-action raid force. Each of the four geographically dispersed Ranger battalions is always combat ready, mentally and physically tough, and prepared to fight our country's adversaries. Their capabilities include conducting airborne and air assault opertions, seizing key terrain such as airfields, destroying strategic facilities, and capturing or killing enemies of the nation. Rangers are capable of conducting squad through regimental size operations and are resourced to maintain exceptional proficiency, experience and readiness. The Regiment remains an all-volunteer force with an intensive screening and selection process followed by combat-focused training. The 75th Ranger Regiment is a proud unit and a team of teams – serving the nation. After that he was stationed at Fort Benning, where he remains, with the 3rd Battalion 75th Ranger Regiment. Michael was well aware that he joined the military in the middle of a very long war, and knew it was likely he would be deployed. "That’s the point of joining the Army;you know at some point you’re going to have to go . If you don’t want to fight in a war you probably shouldn’t join the military." He said they went through a training cycle to prepare for deployment. "We did a lot of scenario based training... of what we should expect overseas." He deployed to Afghanistan at the end of the August of this year. He said what he experienced was almost exactly like what happened in training, and that they continued to train even while overseas. He said that the living was pretty cramped, but it could have been worse.. "It was really dry and there were big changes in temperatures between night and day. It wasn't horrible living conditions. I imagine it's a lot better how we lived than how they did in other wars. It wasn't bad how we lived. We had indoor plumbing, we had laundry rooms and computer rooms. So, it wasn't horrible." The food, he so eloquently stated, "sucked." He wasn't able to tell me a lot of the details about what went on while he was in Afghanistan, except that they went on missions. And during those missions they accomplished that thing that Michael dreamed about as a little boy building forts...they got the bad guys. "It was pretty rewarding when we got to go out and catch whoever it was we were looking for, because that meant there was somebody less in the world that was going to try to hurt people"
They had to deal with mortar attacks on a daily basis and while it was unnerving to Michael, it made him a better person. "Being overseas and being away from everyone you know and love, and getting shot at on a daily basis...when you get home you appreciate those things more when you wake up in a peaceful place...you are a little more thankful for every day that you have." He made it back safely to the U.S. on Thursday, October 24.